A quick lunch with a little more punch. A real power lunch. And here's the long and short of it: order a la carte or go for the set menu, either way, you'll feel like a boss at Raffles Makati's Long Bar. The Long Bar launches The Long & Short Of It, the Long Bar's power lunch from 12nn to 3pm, Mondays to Saturdays, offering a la carte and set menu dishes consisting of international classics and reinvented pub favorites. The Long Bar's rich history from its colonial past adds a sophisticated elegance and vibe, and nobody does a power lunch like the Long Bar. Have some cocktails along with your lunch, and complete your Long Bar experience (see more of Long Bar's signature cocktails and bar chow here at http://dude4food.blogspot.com/2013/06/another-round-at-raffles-makatis-long.html). Great cocktails. Great food. Great company. And one cool place. All the elements for an awesome weekend afternoon at Raffles Makati's Long Bar. In one epic weekend afternoon, I sampled a round and more of Long Bar's signature cocktails, including their new Bar Chow at the Long Bar, plus a selection from Long Bar's new Power Lunch Sets (more on the new lunch dishes soon in a follow-up post). A jogger takes a break before pushing the last mile. A pair of dog owners in their regular morning walk check the breakfast menu posted outside the many establishments. There's a nice stillness in Serendra on a weekend morning, as the early morning crowd slowly trickle in, looking for one thing. Breakfast. Just a few minutes past 8am, Sentro 1771 at Serendra is filled with the early morning crowd for the popular breakfast sets. After trying the signature dishes at Sentro 1771 for lunch (see my previous post here at http://dude4food.blogspot.com/2013/06/sentro-1771-rediscovering-old-favorite.html), it was time to try Sentro 1771's unique modern Filipino twist on breakfast. After trying out Kitayama's Wagyu Beef at Nomama Artisanal Ramen (see my post here at http://dude4food.blogspot.com/2013/02/nomama-artisanal-ramen-definitely-not.html) and Malcolm's Deli (check out my post here at http://dude4food.blogspot.com/2013/05/a-cool-weekend-brunch-at-malcolms-deli.html), I was looking forward to the Kitayama Wagyu Beef Festival at Ristorante Bigoli. I was also curious as to how Ristorante Bigoli, an Italian fast casual dining resto would use the premium beef in their menu. And thanks to the cool team at Zomato, I had a chance to sample Bigoli's unique Italian take on Kitayama's Wagyu beef. Krispy Kreme once again launches another cool cross promotion, this time with Disney Pixar for their latest animated film, Monsters University. A dozen donuts featuring your favorite Monsters University characters, recreated by Krispy Kreme in a delicious dozen of vibrant colors and flavors. Located at the second floor of Fort Pointe Building, Sunshine Kitchen is one of many restaurants at The Fort Strip. Known for its artisanal pizzas, Sunshine Kitchen serves classic comfort food drawing inspiration from American, Italian and Spanish/Basque cuisine. Salmon. From sashimi to gravlax, baked, steamed and grilled, and everything in between. Salmon a hundred ways and more. Diamond Hotel's Corniche launches its Salmon Nights, a seafood buffet showcasing a variety of premium salmon dishes, including Norwegian Salmon, every Friday. In addition to the premium salmon selection every Friday at Corniche, the buffet also includes the signature Japanese corner, a grilling station, appetizer counter, and the popular desserts station, featuring homemade ice cream and cakes from Diamond Hotel's The Cake Club. A real power buffet any way you look at it. One word. Impressive. From the restaurant's sheer size and scale down to each individual dish, Gloria Maris Shark's Fin Restaurant offers one of the best and authentic dining experiences in the metro. A tradition of fine Spanish cuisine from heirloom family recipes, excellent steaks and perhaps still the best Caesar's Salad in the metro. For over forty years, Mario's continues to serve its classic dishes with the same consistent quality and passion, and a flair that can only be described as Mario's way. Old school is still definitely way cooler at Mario's. From its very first restaurant in Baguio along Session Road, the story of Mario's is an amazing one, and quite inspiring. Mario and Nenuca Benitez always dreamed of having a restaurant of their own, and in 1971, opened the very first Mario's in the summer capital. Mario's quickly gained a loyal following, serving traditional Spanish cuisine from Nenuca's cherished family recipes passed down from generations. Today, the second generation continues the tradition of fine Spanish cuisine, as well as incorporating new dishes with the cool Mario's touch. Yabu, The House of Katsu, offers something new again for Katsu fans...and more katsu love. Tracing its origins to Nagoya, a region noted for its red miso, miso katsu is a regional variation of the traditional katsu with red miso paste as the sauce for the dish. The red miso paste has a noticeably sweeter and nutty flavor that works great with the crisp katsu cutlet. A cool twist on the usual katsu, definitely different. Good to know that Yabu continues to introduce new dishes, with even more options for diners. French ham on a freshly baked brioche, topped with duck egg. Just can't get better than that. And in the fading afternoon light at Serendra, Mesclun Bistro shines with its unique and diverse menu. Chef Katrina Kuhn-Alcantara is at it again, with her own take on classic dishes inspired by French and continental cuisine with that unique Mesclun touch. After sampling Chef Katrina Kuhn-Alcantara's Mesclun Restaurant and Cafe at The Linden Suites (see my previous post here at http://dude4food.blogspot.com/2012/12/a-mix-of-flavors-at-mesclun-restaurant.html), I was looking forward to her second branch at Serendra. Mesclun Serendra offers the same classic dishes, but in a more casual, bistro-style setting. Formerly Cuillerre, Chef Katrina Kuhn-Alcantara's French resto, Mesclun still retains some of the signature dishes from the former resto, adding to the vibrant mix of flavors Mesclun is known for. And true to its name, one can sample a wide range of flavors at Mesclun, from French cuisine to Alsatian style flatbread pizza, and even pasta with sisig. I remember the first time I tried Sentro 1771's Corned Beef Sinigang so many years ago, and reliving that exact same experience every time I visit Sentro 1771. With each spoonful of Sentro 1771's classic Corned Beef Sinigang, I remember countless overtime meals at the office, made so much better with this dish. A pioneer in modern Filipino cuisine since 2002, Sentro 1771 still leads the way with its classic take on traditional Filipino dishes with a refreshing modern and cosmopolitan twist. Owned and managed by the same group behind Duo, Zuni and Sutra, all fine dining establishments, Asya is the group's first restaurant concept offering Filipino cuisine with a mix of Chinese, Japanese and Thai dishes at friendly prices. The group's experience with its high-end restaurants comes to play in Asya, where quality ingredients blend with traditional Filipino and Asian flavors at reasonable prices. Like an old friend, HK Tan warmly welcomed us to his restaurant, Singapore Food Republic, and promised authentic Singaporean flavors for lunch. As we settled down to our seats, HK Tan gave a brief overview on the lunch menu. This was going to be another great lunch. Singapore Food Republic is HK Tan's second Singaporean restaurant, with another, Nasi Lemak, located at Robinson's Galleria. Singapore Food Republic offers traditional and iconic Singaporean dishes, from beverages to mains, all the way to desserts. 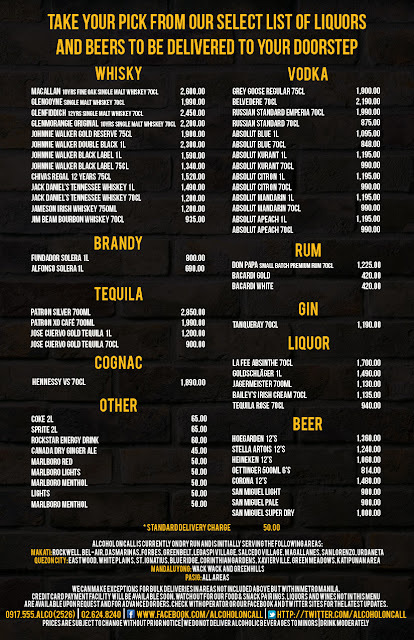 Whisky, vodka, brandy, rum, teuila, gin, beer...you name it, the guys at Alcohol on Call's got it. Plus more. It's your very own party on call. Very cool. Planning a spontaneous and impromptu tequila session tonight? Give these guys a call. And you're on your way to one cool and convenient drinking experience. 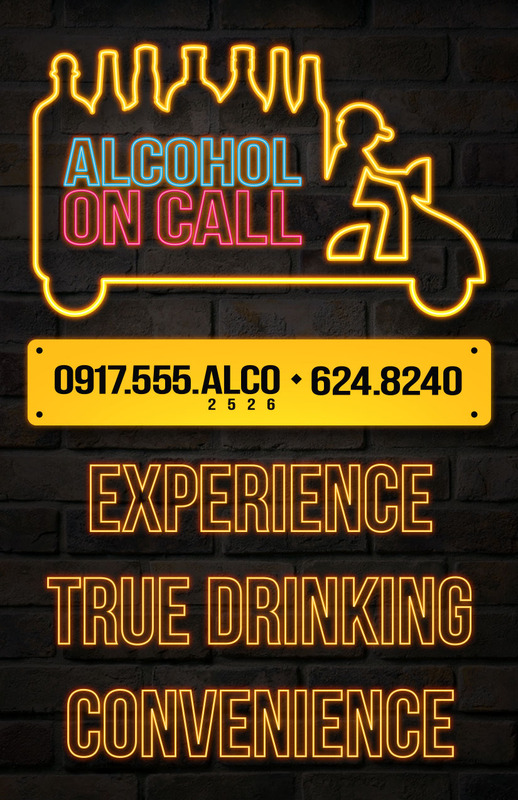 But before you call your friends and neighbors, check if your address is covered by Alcohol on Call's delivery coverage. Dude for Food is now on Facebook, check out the FB Page for regular updates on good eats and cool new products and services. Better yet, click :Like: and enjoy the ride...just look for the FB "Like" widget on the right sidebar. Treat your dad to a special Buffet at Naci Comfort Food on June 14, 15 and 16 for a real comfort food feast. 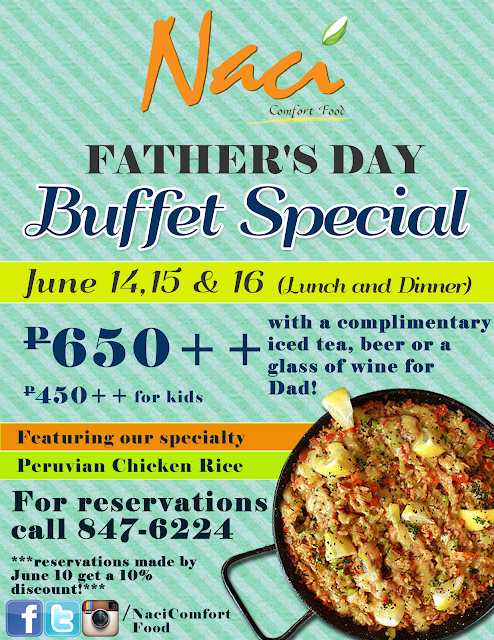 The cool buffet includes Naci's signature Peruvian Chicken Rice and other house specialties. Plus, Dads get a complimentary beverage of their choice, including iced tea, beer or a glass of wine. Very cool. And there's more. Reservations made by June 10 or earlier get a 10% discount. Nice. If you're planning a special treat for your dad this weekend, this one's a pretty cool idea. Check out my previous post on Naci Comfort Food and see some of their signature dishes here at http://dude4food.blogspot.com/2013/05/coming-home-to-naci.html. Naci Comfort Food is located at Unit 3, Two Parkade, 7th Avenue, Bonifacio Global City or call 847-6224 & 0917-523-4315 for inquiries and reservations. Dude for Food is now on Facebook, check out the FB Page for real good eats and cool promos. Better yet, click "Like" and enjoy the ride...just look for the FB "Like" widget on the right sidebar. Early Sunday morning, the second and last day of my weekend staycation at F1 Hotel Manila. Funny how easy it is to wake up really early on a weekend, despite the late night with one too many shots of Scotch and an awesome barbecue dinner at F1 Hotel Manila's Canary Lounge. I think that's the magic of a weekend staycation, when you find yourself totally free of stress and fully recharged. A walk down the poolside has a calming and soothing effect, and no, it's not the residual Scotch still circulating in my system. The early morning light and the still waters of the pool combine for a tranquil morning, and yet I have to remind myself that I am still in the middle of a bustling commercial district. But yet, one feels a million miles away. An impressive all-Filipino lunch buffet featuring a variety of regional flavors. A cool afternoon with master chefs. And an awesome barbecue dinner. And there's no better way to end Day 1 of my cool weekend staycation at F1 Hotel Manila than with another epic food trip. F1 Hotel Manila's poolside Canary Lounge is definitely the place to be, perfect to catch the sunset with a few drinks and cocktails. And every night, the Canary Lounge hosts a barbecue dinner with Filipino, American, and Brazilian specialties, from ribs, chicken, beef and seafood. Barbecue. Beers. Bonding. Awesome. After enjoying an epic all-Filipino buffet lunch at F1 Hotel Manila's LUZVIMINDA Filipino Fiesta of Flavors (check out my previous post on the awesome Filipino food fiesta here at http://dude4food.blogspot.com/2013/06/simply-awesome-luzviminda-filipino.html), it was time to get to know the chefs behind the month-long food festival. Led by F1 Hotel Manila's very own Chef Sau del Rosario and assisted by Chef Willie Ertez, the culinary cast for the food festival included noted chefs from the Visayas and Mindanao who shared their distinctive style and authentic regional flavors. The participating chefs in F1 Hotel Manila's LUZVIMINDA Filipino Festival of Flavors spent an afternoon with guests sharing their signature regional recipes, highlighted by unique dishes from Cebu and Davao. And the best part? The recipes are included at the end of the post so you can recreate some really cool regional dishes. The best of Philippine cuisine, from Luzon, Visayas and Mindanao, all in one place. For one whole month. Awesome. F1 Hotel Manila launches an impressive all-Filipino buffet, the LUZVIMINDA Filipino Festival of Flavors, starting June 1 to June 30, showcasing a variety of regional flavors and a full range of dishes. Spearheaded by F1 Hotel Manila's very own Chef Sau del Rosario and assisted by Chef Willie Ertez, one can expect nothing but the very best of Philippine cuisine. With the festival's regional theme, F1 Hotel Manila tapped guest chefs from different regions for authentic flavors, like Chef Martin Jickain from Station Juan Cafe' at the White House Boracay; young chefs Paul Sydney Uy and Karl Noel from Cebu, both successful restaurateurs specializing in Visayan cuisine; and veteran Chef Ed Tuazon and his team from Marco Polo Hotel Davao to complete the Luzon, Visayas and Mindanao culinary feast. Each chef brings their distinct style and regional flavors in one truly epic celebration of Philippine cuisine. The cool month long festival allows diners and guests to rediscover the different regional flavors, without even leaving Manila. F1 Hotel Manila is the very first hotel to open at The Fort, and centrally located within walking distance to corporate offices, shopping centers and restaurants in The Fort area. Everything is just a few minutes away, it's an ideal base for a perfect weekend at The Fort. Real Italian dishes. The best and freshest ingredients. All made from scratch. Every single day. And now you can get a true taste of authentic Italian flavors at Lombardi's newest location. Chef Davide Lombardi opens his second restaurant at the new East Wing of the Shangri-La Plaza Mall, offering authentic Italian classics using the very best and freshest ingredients for a true taste of Italy. And just like his first branch that bears his name at Robinson's Magnolia, one can expect rustic and traditional Italian dishes the way it should be. Born and raised in Milan, Davide Lombardi's passion for for cooking began at an early age, helping his grandmother in the kitchen while preparing family meals. Thus eventually led to stints with some of the famous restaurants in Italy, and then to Paris where he worked for fifteen years. It was in Paris where he met his wife, and moving to the Philippines was just a matter of time. Chef Davide Lombardi brings with him years of experience, and one of his goals is to bring the authentic taste and experience of Italian cuisine. At Lombardi's, you get exactly that, real Italian dishes true to its origins using the best and freshest ingredients, and never tweaked to suit the local palate. There is an old Spanish saying that goes "a full stomach makes a happy heart." At Calderon Cocina Tapas y Bebidas, I did leave with a full tummy, and needless to say, a very happy heart. Now you don't have to go far for authentic Spanish dishes and tapas, just head down to Calderon. Calderon Cocina Tapas y Bebida is a culinary collaboration of Monchet Carballo (the man behind Sabor de Espana at the Salcedo Market), Marmi Perez, Angela Melo and Chef Rafa Ysip. And their passion for Spanish cuisine is immediately evident once you enter and taste Calderon's signature dishes. Authentic, rustic and rich, just the way I remember it. And at Calderon, the dishes are comfortingly familiar, yet there is something refreshing and new.